Industrial Jibs - The forklift jib would allow a worker to shift their heavy loads overtop of obstructions or obstacles onto roofs, raised platforms, and even decks. They can be utilized so as to reach the second or even third level building platforms to be able to move or pick up loads at places that are still under construction. Fork truck jibs are used in order to unload trucks and flatbed trailers, to laminate wood and suspend trusses. Jibs are even usually utilized for reaching over scaffolding meant for masonry work. 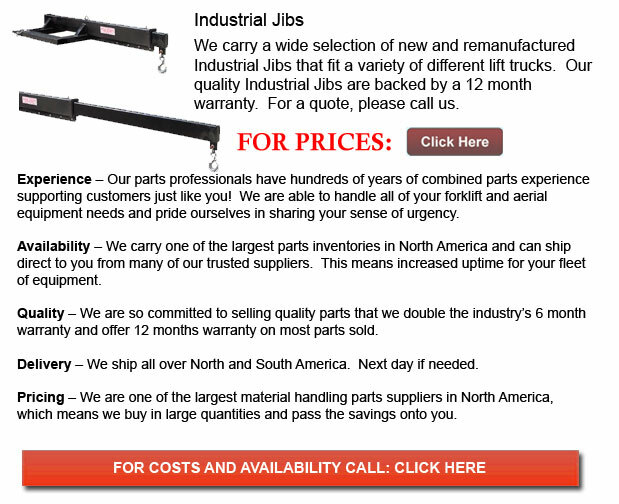 Each forklift jib attachment is equipped with two revolving hooks. One of the hooks could be manually fitted on the base of the boom at whichever position whereas the second hook stays connected at the end of the jib. This permits the individual operating it to be able to carry stuff which have two hook points. Dependent on the size of the model, every hook is rated at either four thousand or six thousand lbs. It is possible to utilize either one hook or even both to pick up a load. The person operating it needs to make sure that the entire weight of the jib and the load doesn't go beyond the rated capacity of the jib as shown on the load chart for that extended or retracted position. Jib accessories are made so as to be utilized on rough terrain straight-mast lift trucks, industrial lift trucks, or on extendable-reach lift trucks. Forklift jib cranes install onto the forklift through inserting two forks into the fork pockets. The rear of the jib crane then seats against the rear of the fork and a safety chain wraps the forklift carriage to hold it into position. The load capacity of a lift truck jib has a most of approximately 1935 lbs to 6000 pounds on either the extended or retracted positions range. You may have to consult with a material handling specialist regarding the particular limits of your lift truck use. The load capacity rankings are intended for the jib itself and not the forklift or the maximum load which can be transferred safely utilizing a particular forklift. It is essential to remember that at any time when whatever attachments such as a lift truck jib are fitted to the forklift, the new center of gravity created by the attachment would lessen the general lift capacity of the forklift. There are guidelines accessible that offer information on how to properly determine these load limits. Prior to utilizing a forklift jib, make sure that it is well secured to the forklift with hooks and shackles. Always be sure to verify that the screw pins are tight. It is very important to also be sure that the load calculations have been made properly. Bear in mind to take into account the truth that rated capacities at times decrease when the boom is in an elevated position, whenever the boom is extended with telehandlers or even each time the mast is slanted forward. Important tips whenever making use of an adjustable jib is not to ever pull a load utilizing this particular sort of accessory. These kinds of accessories are actually only designed for vertical raising. Also, avoid letting the load move back and forth. Utilize extreme caution every time a load is lifted so as to avoid tipping over the truck.